For parents, the job of helping kids navigate the decision process around whether or not a video game is appropriate is not easy. Online reviews indicate the “maturity” level of a game, while a kid’s peers provide a rating of “cool” or “not cool”, and balancing the two is tricky. As a technology blogger and a mom with a tween boy & twin boys in elementary school, one of my “go-to” resources to learn about video games is the ESRB (Entertainment Software Rating Board) rating and website. They are the wonderful people who create the rating that shows up on video game packaging (i.e. E for Everyone, EC for early childhood, E10+ for children above 10 years of age, T for teen, M for mature). I had the fabulous opportunity to talk to Patricia Vance, President of the ESRB, while I was at the CTIA wireless conference in San Diego . The conversation with her helped me learn more about the ESRB rating process, enforcement, and resources as well as some of the newer features like the mobile app. Patricia Vance has an impressive background. She was appointed to the National Telecommunications and Information Administration’s Online Safety and Technology Working Group (OSTWG) and testified before both the U.S. Senate and House of Representatives on behalf of the ESRB. Vance highlighted that the ESRB was created with parents in mind and funded by the Industry. The ESRB team starts the game rating process by reviewing an extensive questionnaire and DVD created by the video game company. They then meet to discuss a rating. Game Raters follow-up by playing many of the games after they are released, checking for full disclosure of the content during the rating process. As a parent, I am so thankful to have a team putting that much work into understanding and documenting video game rating information. To make the video game decision process even easier, the ESRB has a mobile app for the iPhone, Android and Windows Phones. 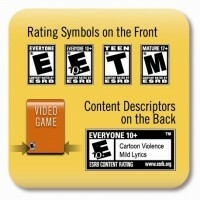 This allows parents to review the ESRB rating information even while at the store. So if your child says “Halo Reach has no violence” – you can say “the ratings seem to disagree – and here is why!“.